For the awareness and growth of Western classical music in India, a proper music education system, along with musically educated teachers and increasing number of live performances are needed. One such successful occasion was organised in Hyderabad by Joe Koster from Hyderabad Western Music Foundation and Musee Musicals. We didn’t hand out any programme notes, but explained each piece with historical facts, providing an insight into the periods, compositional styles and other related facts. This helped the audience to connect with us and the music. It was clear from the beginning that rather than a competition, we wanted it to be more of a festival – A musical celebration showcasing musical talents from the Twin cities for a finale concert. I, along with Cecil Vineet and Abhishek, a localite music composer and arranger were invited to select 18 best musicians out of the 40 participants for the finale concert. We auditioned all the participants on the 10th and the 11th of November and selected 18 musicians. The age of participants ranged from 7 years to 30 years and their levels- grade 4 to LTCL respectively. The Festival also included Jury in Concert on the 11th of November, featuring both the jury members. We have very promising Indian talents in Western classical music- however teachers should also look forward to upgrade their knowledge so as to fill that musically intermediate void. I performed Ah Vous Dirai je Maman by W.A Mozart, Chopin’s Scherzo No.2 in B flat minor Op.31 followed by Rachmaninoff’s famous Prelude in G minor Op.23 No.5 and Pour le Piano by Debussy. Cecil Vineet performed Rachmaninoff’s Prelude in C sharp minor Op.3 No.2 along with his own orchestral arrangement for the piece rendering it a concerto- nature. The concert concluded with both of us playing 3 movements from Ravel’s 4 hands suite- Ma Mere L’oye. We didn’t hand out any programme notes, but explained each piece with historical facts, providing an insight into the periods, compositional styles and other related facts. This helped the audience to connect with us and the music. Personally, I was blown away with the talent that these twin cities had to offer. The Grand Finale Concert on the 12th of November featuring all the 18 selected participants, showed immense dedication and seriousness that all the performers had put in. There wasn’t much time between auditions and the finale performance, but all of them performed their pieces way better than their auditions. We also had a 4 hands and a Recorder-Piano duo giving a distinct flavour to the concert. There comes a moment of brilliance as soon as one hears any musician- whether or not he/she can make it as a professional performing artist. That same feeling came for three of the pianists from Hyderabad, while listening to the Finale concert. 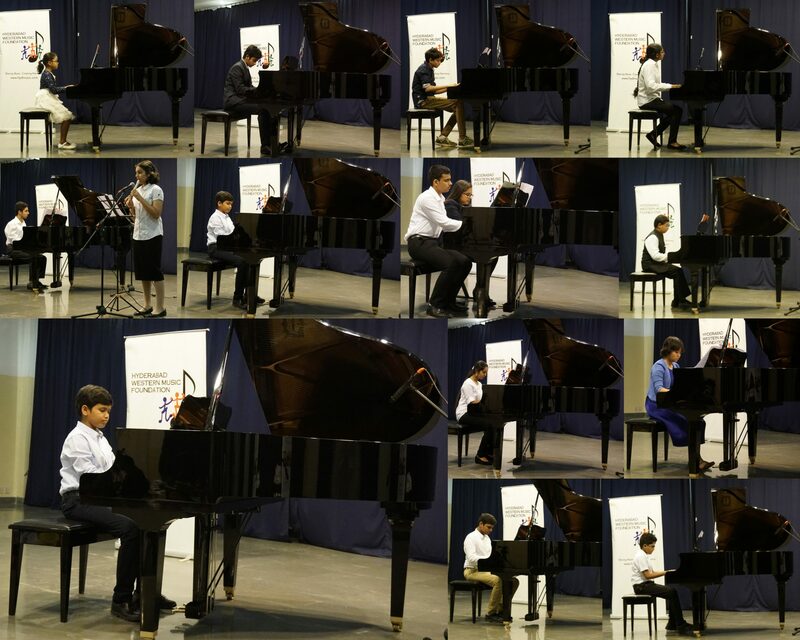 There was Yash Aggarwal who played the Mozart Sonata in C K 309. It was full of vitality and brilliance. Then there was Devulapalli Sai Sri Vaishnavi who amazed every one with her piece, “Spider in the Bath” and brought out a proper comical character in her performance. Finally, Saketh Ram mesmerised us with his interpretation of Liszt’s Orage. At the end of the concert, each musician was awarded a prize and three out-performers were selected: Devulapalli Sai Sri Vaishnavi, Saketh Ram and Harshith Reddy. We have very promising Indian talents in Western classical music- however teachers should also look forward to upgrade their knowledge so as to fill that musically intermediate void. Shantanu Patel, is an aspiring concert pianist from Ahmedabad, India. Though he started playing the piano at a later age of 17, Shantanu has had his training in Western Classical theory and digital keyboard from the age of 12. He began his journey as a classical pianist after joining KM Music Conservatory Chennai, founded by the Oscar Award winning film composer Dr. A.R. Rahman in 2011, where he learnt piano performance under the guidance of Dr. Adam Greig and completed his first three years of BA(Hons) Music. Under the transfer programme affiliated with Middlesex University, he went on to complete his fourth year in London and graduated with BA(Hons) Music specialising in piano performance in 2015. At Middlesex University he learnt piano under Professor Laura O'Gorman. In the same year, he was offered a place for Masters in Music at The Royal Conservatoire of Scotland on a partial scholarship. At RCS, he learnt piano under Professor Fali Pavri and conducting under Nigel Bodice, Alasdair Mitchell, Norman Beedie and graduated with a MMus specialising in advanced piano performance and conducting skills in July 2017. As a concert pianist, Shantanu made his debut concerto performance with the London Firebird Symphony Orchestra in 2015, playing Mozart's Concerto in D minor K466 with his own composed cadenzas combining Indian classical elements. Since then he has performed extensively in the UK. Currently he is performing and providing masterclasses/ workshops across India before returning back to Scotland for a Doctoral in performance from RCS in a few years.